Jody Maberry shares how a business focuses on what makes them unique in his podcast. Imagine if we all did the same. Let's talk about it. New logo defining the show more completely. That's my FACE on there now! I feel a bit nekkid putting my face out there for the whole world to see. It's just one more step to not being holding myself back. It took about a year for me to get off my duff and do this. Also, you may have noticed that's an elephant topping the "I" in Think. The elephant runs in a matriarchal order. Not that I don't appreciate men, I just come from a long line of women taking care of more than their share. I honor those women, and each of us, who lead families, work teams, organizations, and share our influence with the world in that image. Then you see my name a little structured and maybe a bit mischievous. That's me. I learn more when I'm playful. It's the balance of the structure and the creative that makes me who I am. This started out as "The end of the year booklist." But this is more than that. I'm not a fantasy reader. I don't get into to fiction much, because, I have more practical things to take care of. And that's what my list of books has brought me. Practical solutions. Excellent reads. Lessons and strategies. I like to implement directly. In fact, I've been told I just run with an idea like a horse out of the gate. Here's my criteria to make it on this list. Year of Yes, by Shonda Rhimes is a powerful read to help you realize that you are not being sensible, safe or living smart...you could easily be living in fear. And not even know it. A perfect read for the woman that: Is ready to start her new year and step out of her comfort zone. She's not quite sure where this will take her. The leap of faith is what she needs. Brene Brown makes me realize I'm not alone in my challenging thoughts. Braving the Wilderness is as the tagline reads, the "Quest for True Belonging and the Courage to Stand Alone." If there's one thing we have learned in 2017, it's that people think differently than we do. That should be okay. Using the internet, we can polarize ourselves on issues and create battlefields that hold us back. This book helps us find an understanding and be willing to discuss the issues in peace. "True belonging doesn't require you to change who you are, it requires you to be who you are." Read in the month of November, I've re-read it 3 times now. That's saying a lot for me. The Big Leap takes a deep, deep dive to on how each of us can hold ourselves back. There are many reasons we believe we are unworthy. In our interview with Jon Stolpe, he mentions this book. I devoured this book in a couple days. Wrecked touched my spirit. it is so easy to be involved in your own life, that looking out for other's needs doesn't seem to be the top priority. A perfect read for the woman that: Seeking new insights, tools, and find ways to serve & have more compassion in the daily routine. She is ready to "get over herself," and have a more humanistic view of the world, then put her talents to use in some capacity in that. This is the book a lot of us need. The 5 Second Rule is the book that helps us overcome that space from, "Yes, I know I need to do this thing..." and "I am doing this thing." That space is where we can get so stuck. We think about accomplishing that thing. We talk about it. We have a pretty good plan to make it work. A perfect read for the woman that: Has had the same resolution for the past few years. She knows precisely what has to happen but she just doesn't feel like it. She wants to change, really change, but gets stuck in her head. It’s your mental Vitamin B for the week. Each Monday I share a little motivation & insight to start the week. You’ve got a lot of people depending on you. There is big work to do. So here’s a maxim for you, the smart, ambitious woman, to help you SHINE. We start out the year with one from Michael Phelps. 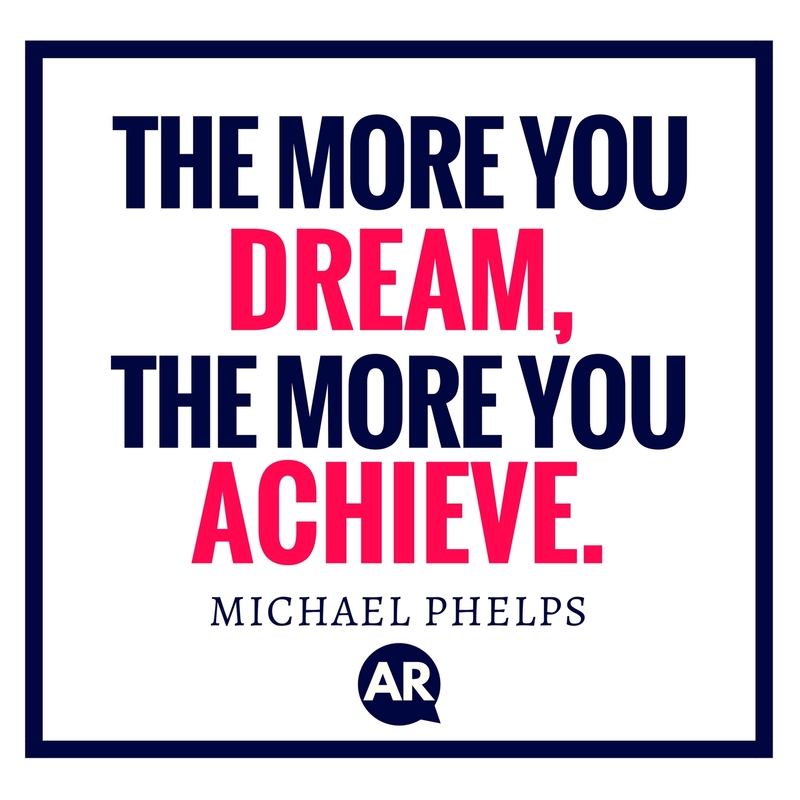 "The more you dream, the more you achieve." Don't hide those dreams in the back of the closet somewhere. Step into it. And watch this year, become your best one yet. 1. Take 15 minutes this week and dream. Think bigger. Imagine. Dive in and feel those feelings of what you want to achieve in this year. 2. Then, and this is so important, write that down. 3. Then get to work.